......... and the challenge was set by Jess. We were asked to make a card any shape that we wanted, but NOT A2 size ... Please support the other girls by visiting their blogs - links are on the left. 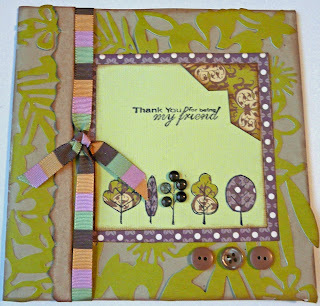 Don't forget to join the Unity Thursday Hip Hop fun ... with heaps of prizes from Unity and lots of fun - go to Splitcoaststampers and click onto the Unity forum ... you'll find us all there ! Any new customers to Unity who order stamps tomorrow valued at $15 or more, will get the single So&So AND *all* orders to the value of $30 or more will receive a free single stamp OF YOUR CHOICE. 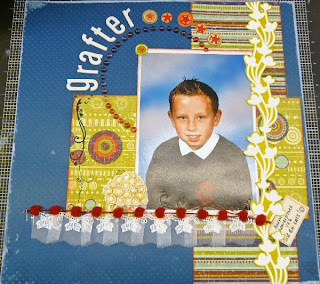 Recipe:- Paper/card - Tinkering Ink, Bazill. 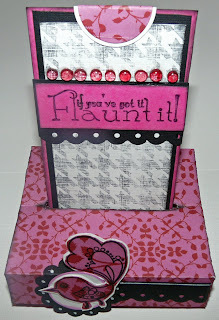 Stamp Set(s):- Dogstooth background Stamp, and Flaunt it set (not the right name, but can't access stamps at the moment). Inks:- Stazon, colorbox chalks .. and lastly, fabby Dewdrops ! ....... well it was the annual 24-hour Pink Booby Crop @ Golbourne, and laughter and merriment were the order of the day ......... oh, and some scrapping and crafting ! Thanks go to the fabby Sonja, Nina and Ali for organising the whole day and for keeping us fed and watered. Thanks also go to everyone for being such a fab crowd of the most talented girls I know. The work on display was incredible - particularly, the 'booby' layouts - brill, brill, brill. Above are a few layouts that I managed to work on and the other 'projects' will be ready shortly. 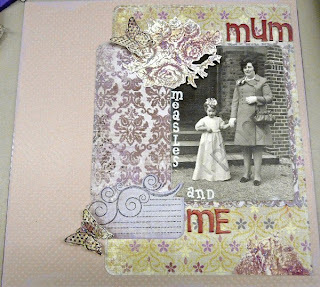 The last layout was done for Jayne, and she is going to add her own journalling. YAY !!! Its the 6th Unity Customer Challenge, and this week the challenge was set by Maggie and the challenge was to use the above sketch. Please follow the links on the left to see everyone else's examples. Don't forget Unity Hip Hop Thursday on Splicoaststampers - loads of giveaways, new releases and great discounts - what more could a stamper ask for .... so hip hop over to the Unity forum on SCS every Thursday - see ya there ! 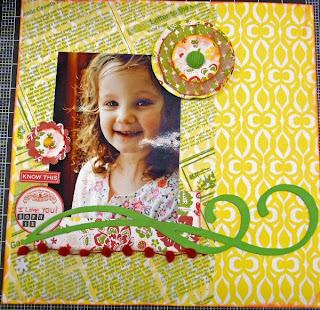 Recipe: Stamps: Unity Stamp Co September kit of themonth, Bazzill: kraft cardstock, paper: KI lace cardstock, Scenic Route Sanoma papers, colorbox chalks, dewdrops, American Craft ribbons.